Offering free services may seem like a good way to keep customers happy, but how much money is your business leaving on the table? By redefining freebies as paid opportunities, B2B firms can generate new sources of income and secure long-term growth. This not to say that companies should stop providing free services altogether, or attempt to turn every free service into a revenue stream. It may make sense to provide free ancillary services as part of a strategy to capture value elsewhere. However, too often services are offered at no cost due to fear, inertia, resistance or a failure to understand how much value they bring. This is increasingly true of new digital services enabling activities, such as pre-emptive maintenance, remote monitoring and industry bench marking. Too many companies use these digitally enhanced offerings solely to facilitate underlying product sales instead of redefining the service into a profitable stream of business for the company. Giving away services may send the wrong signals to all stakeholders, setting a vicious cycle in motion. If services are offered for free they appear limited in value to both customers and employees. Employees may think “why bother?” and spend less effort ensuring excellence of service delivery. When the quality of delivery is poor, customers will not appreciate or take advantage of the offer. And the downward cycle continues. Alternatively, by charging for the service, improving and redefining it and incentivising employees to deliver it professionally, companies can change everyone’s mindset, stimulate demand and create a new stream of revenue. This is what we call the “virtuous” cycle. 1. Taking stock of the services a company provides free of charge. 2. Defining a roadmap, a company-specific action plan, for capturing more value from the services being given away. 3. Driving change, addressing resistance from customers, employees and distribution partners. The first step on the F2F journey is to create an inventory of all the free services the company is offering. Executives need to look at why each service is being given away and make the critical decision: Should we bill it, kill it or keep it as free? A comprehensive inventory will also highlight the extent of the firm’s freebies and just how much revenue is being left on the table. For example, we held a two-day workshop with 12 country managers of a forklift truck manufacturer and reviewed more than 80 services the supplier was providing free of charge. Over the following six months, the company transitioned 14 of these from free-to-fee paying. For instance, the manufacturer introduced invoicing for onsite equipment diagnostics, an activity which service technicians were performing during customer visits. While the individual diagnostic fee was small, customers were willing to pay; the transition resulted in millions of euros of additional revenues in its first year of implementation. Profit drains: Services which do not create value and should be abandoned. Distributer delights: Services which create value for the customers but can be better served by delegating the delivery of such activities to a third party. Competitive weapons: Services which are needed to be kept free as a strategic differentiator. Golden nuggets: Services which customers are willing to pay for and, with some refinement, can be turned into revenue-and profit-generating sources for the firm. To turn these ‘golden nuggets’ into revenue and profitability earners, firms must refine and reframe the service on offer to convey a strong value proposition for the customer. 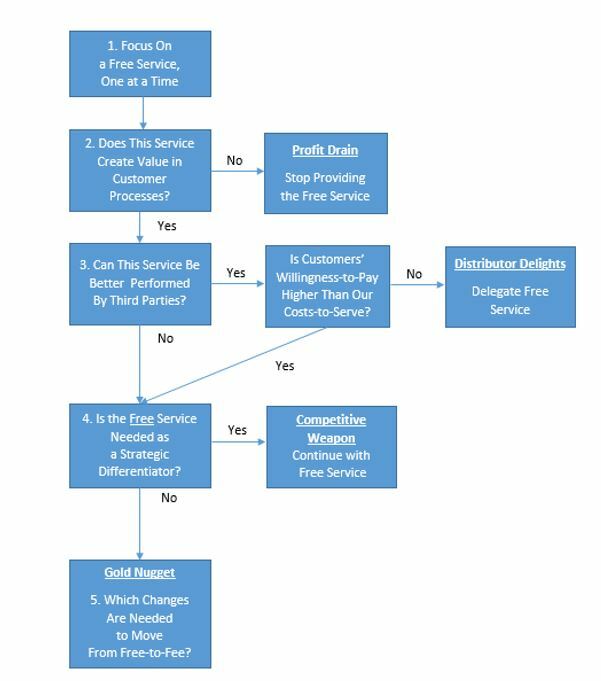 If a free service lacks truly differentiating elements, step back, rethink the job to be done and innovate to include additional value-creating features. This may involve the introduction of a good-better-best offer, where the basic service is free and fees apply for greater service. To reap the greatest rewards, companies need to understand the additional value their free service brings to a customer’s business, quantify cost savings, productivity gains or any other tangible benefits and clearly communicate value created to the customer. Many companies leave money on the table by failing to collect, store and analyse appropriate customer value data to evaluate the value in their customers’ operations. Sustaining the F2F journey is as much about changing company culture and behaviours as it is about hard numbers. Executives need to drive change in the mindset of all participants – employees, customers, distribution partners. Customers already think that prices are too high. Introducing fees creates a longer and more difficult sales process. There is the belief that once customers have to pay for services their expectations increase and dissatisfaction and complaints rise. Charging for services forces sales people into unpleasant, make-or-break conversations with customers. Service pricing excellence is an organisational capability, and it is vital that all employees understand and are on-board in implementing a new free-to-fee pricing model. Often, the best way to do start such a change process is to work closely with the salesforce. Provide the sales team with sales data to justify the new fees. Implement appropriate training and revised incentive schemes to address the longer sales process. Show sales staff that better service enables the company to differentiate its offering, improve customer relations and provide new avenues for cross-selling and upselling. Role-playing realistic sales scenarios helps staff prepare for those hard conversations while sharing best practices and celebrating early successes can greatly enhance a sales person’s pricing confidence. Even with this assistance, some sales staff may not be able to make the transition and it may be necessary to consider hiring new staff with a consulting background who are used to charging healthy fees for service. The transition can also strain relationships with distributing partners if new value-added services being offered are already performed by intermediaries. These relationships need to be considered as part of a thoughtfully planned transition and a clear value proposition documented and communicated to emphasise win-win for all parties. In competitive economic times, companies often look outside their core offerings for new sources of profitability and growth. In doing so they may miss the immediate opportunities for capturing value from services they already provide. While our research focused on B2B companies, the key lessons apply equally to business-to-consumer firms that seek to selectively monetise those service offerings with a strong potential for a successful free-to-fee transition. Wolfgang Ulaga is a Senior Affiliate Professor of Marketing at INSEAD. Stefan Michel is Dean of the IMD Executive MBA. A version of this article was first published in Sloan Management Review. This is a great overview. Love the decision tool. We tested several of our free-to-fee initiatives and the tool and the logic map extremely well. Thanks for this.